Finally ordered some good genetics (hopefully) so lets get right to it. 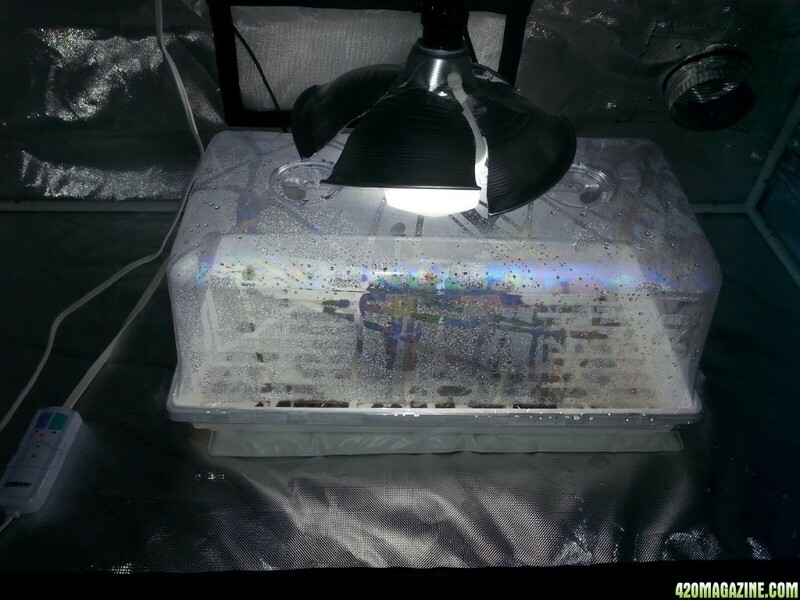 *Grow Room- 4x2x5 mylar tent. 240cfm 6" exhaust fan. oscillating desk fan over canopy. Began germinating 2 days ago 9/9/14. 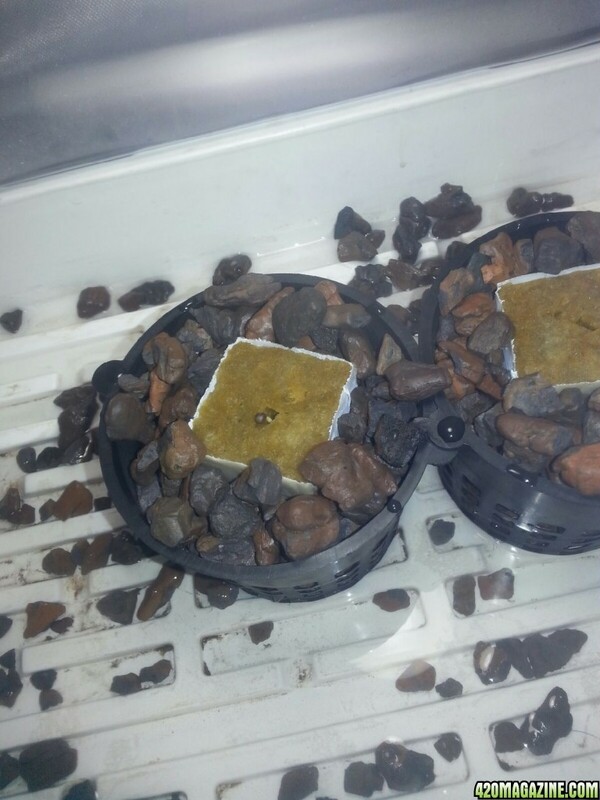 Moved to rockwool cubes today 9/11/14 at noon and at 8pm already had one seed out of the cube. Looking good! I believe the Z7 is beneficiary bacteria but just make sure it is! You for sure need that in your reservoir once you get going. I have not personally used Z7 so let us know how it works! good luck and im subbed! Check out my grow journals! Subscribed. I also grow AK48, you can see my AK48's in my http://www.420magazine.com/forums/journals-progress/215016-kingjohnc-s-lush-lighting-led-dominator-2x-soil-indoor-grow-journal-review.html. FlyingSkull isnt super clear about what is in there product but it is all natural and non toxic and prohibits the growth of slime and bad bacteria so if its not actually considered beneficial bacteria it does the same thing. I love the stuff. I had a bad root rot problem with my last DWC and the friendly guy at my local hydro store gave me the Z7 and it cleared everything right up. Here with an update on my little ak48's. I soaked the rockwool cubes over night in PH adjusted water with Z7 and 1/2 strength SuperThrive. After a few days in a humidity dome and on a heating pad set to low, the seedlings are doing fine. Not a lot to talk about yet just nursing the babies until the roots start to show through the net pots and then ill move them to the DWC. I made my DWC out of a 5 gallon storage tote. 2 air stones and a 25 gallon air pump. Holds 6 plants. Here's what they look like today, 3 days since sprout. Glad they popped! You should bring your light closer as they are stretching for the light! I was aware of temp affecting gender but since there feminized seeds i didnt think it mattered. Ive removed the heating pad already anyway but for future reference, do you think it could affect feminized seeds? 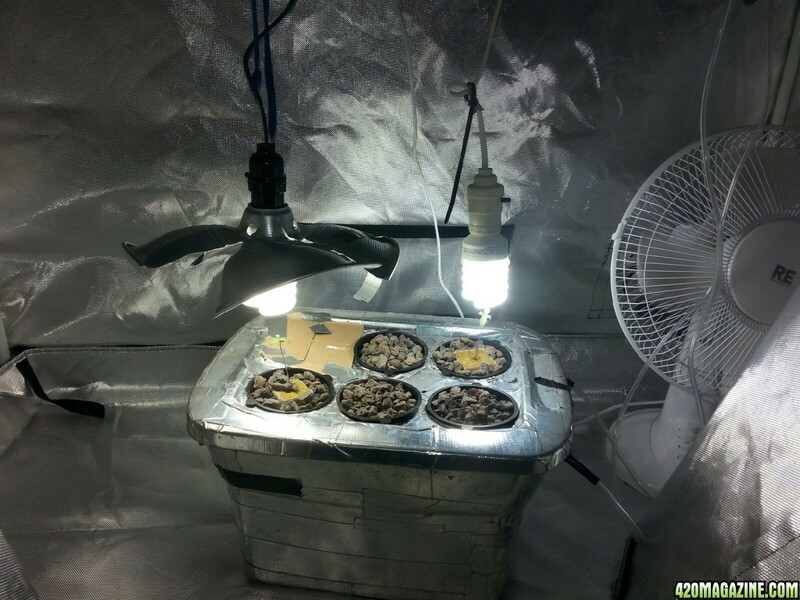 Feminized seeds have a 95% chance of being a female plant, I would not use a seedling heat mat with cannabis seeds. Thanks for stopping by. I added a small desk fan the other day and the stems are getting sturdy so im not terribly worried about it. This was my first time using the humidity dome and I dont think ill be using it again. Just for clones kinda thing. This grow hasn't gotten off to a great start. They over stretched in the humidity dome and i didn't even feed them anything but 1/2 strength SuperThrive and Z7 until yesterday when i poured 1/4 strength Ionic grow over the rocks. Work has consumed more of my time than i would like and its kept me from tending to the girls like i should have. I tried to post last night but the reply box was grey and wouldn't let me add any text. Not the first time this happened, anybody know what that's about???? Anyway, I moved the girls to there DWC 2 days ago because the roots had yet to protrude from the net pot. Next time I'll put them straight in the DWC and keep the water level just touching the bottom of the pots. Ill also try to start the seeds off with like 1/6 strength Nutes. This is them last night. 1 week after sprought. My DWC: 5 gallon tote. 3 gallons of solution. When you encounter an error please reboot your computer and attempt again, if your error persists please report your error to this forum with a screenshot if possible. 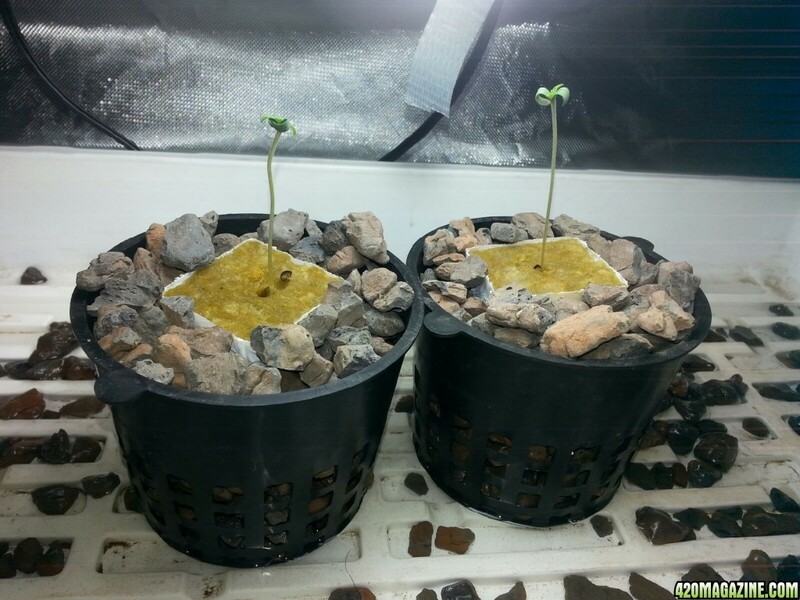 Seedlings need no nutes until around week 3 which should be 3-4 sets of real leaves. 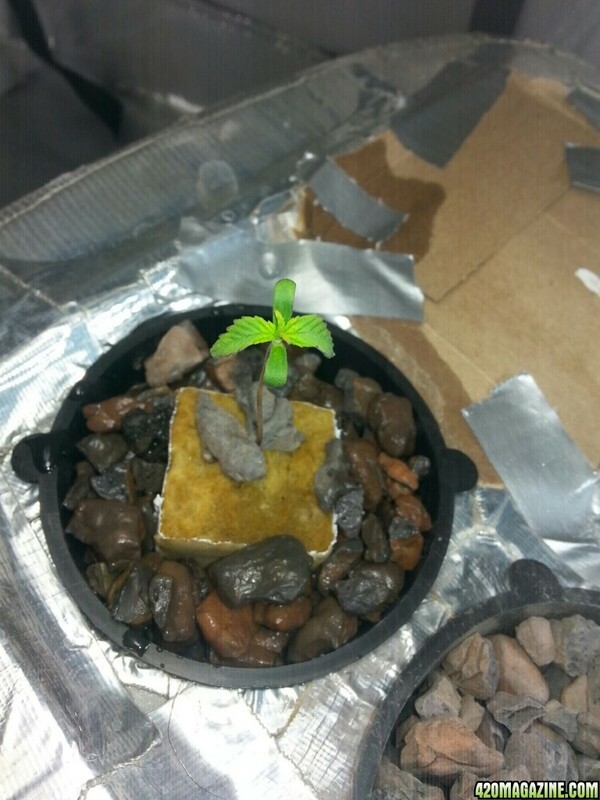 No nutes are needed for seedling stages... In everyone of your pictures everything looks so wet. 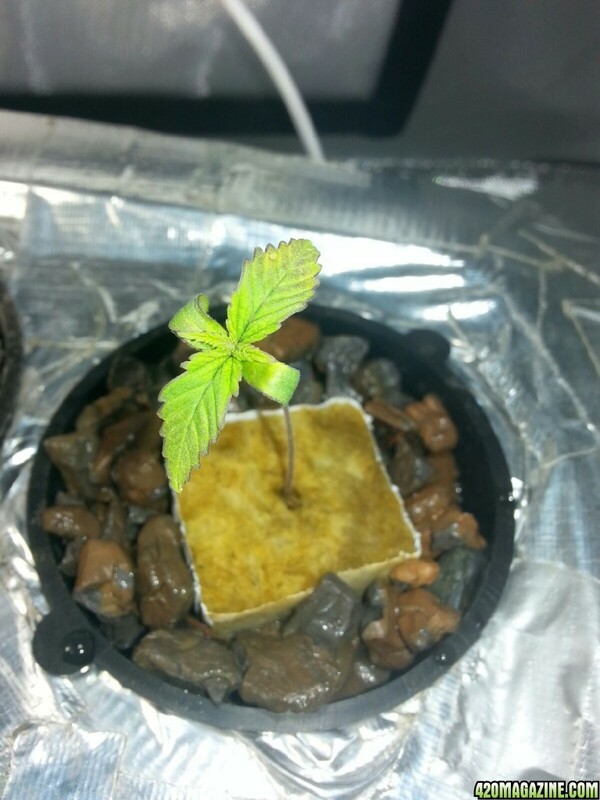 It looks like you are over watering and your rockwool cubes are staying to wet. I would not water anything at this point and leave the water level just at the bottom of the net pot and wait for the roots.... No need to top water at this point. Also: I have not seen anything that you mentioned pH. Your pH should be around 5.8. What is your current pH? Light leaks shouldnt cause brown algae. If you have brown algae that is where your deficiencies are coming from.... Light only creates green algae. If you are running Z7 you shouldnt have algae period. If you do, its not working or you have not added the correct dose. Usually deficiencies in early stages like this is either from pH problem or from root rot or slime. Just my two cents! Maybe someone with more experience can chime in. Good luck!